This is a reject. No seriously…it is. Now there really isn’t anything wrong with this card but it ended up in my reject pile. What is my reject pile? It’s cards or projects I made for a particular reason then I decided I didn’t like it for that reason. 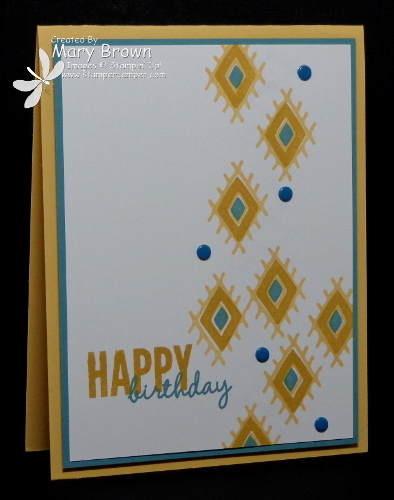 I did this card for an upcoming challenge but after it was done, although I liked it…I thought I could do better for the challenge so into the reject pile it went. I decided though I would share it because the Bohemian Borders is just such a fun set to use. Stamp HAPPY in Hello Honey and birthday in Lost Lagoon. Layer panel on Lost Lagoon – 3 7/8 x 5 1/8 and add layer to card front using dimensionals. Add some Island Indigo Candy Dots to finish it off. This entry was posted in Clean and Simple (CAS) and tagged Bohemian Borders, Celebrate Today. Bookmark the permalink. do NOT understand why you did not like this card. i LOVED it and plan to case it this afternoon. thanks for posting it anyway, even if it was not what you wanted!! !